Move over, Valentine's Day, this our favorite holiday in February. For lovers of ooey, gooey cheese and classic Italian flavors, is there really anything better than piping hot slice of pizza? If that pizza is free, then absolutely. On Saturday, pizza lovers will be able to enjoy plenty great deals (and even a few freebies!) because Feb.9 is National Pizza Day. According to National Today, which surveyed 1,000 people, only 2 percent of those questioned claimed to dislike the cheesy staple — talk about an uneven pie chart. They also discovered that the most popular pizza toppings nationwide are cheese, pepperoni and sausage. Just don't tell Dwayne "The Rock" Johnson and his cohort of pro-Hawaiian pizza fans, but pineapple was ranked as the least favorite topping. Whichever side of the pineapple-pizza debate people land, here are some deals worth the cheat meal. This California-based pizza chain, which makes made-to-order pizzas in a Chipotle-style way, now has over 300 locations across America. Though the chain is known for its in-store offerings, for those ready to order online, Blaze is offering two pepperoni pizzas for just $10 on Saturday. At Chuck E. Cheese's, now through Feb. 9, get a free extra-large upgrade when you order a pizza of any size. Just use the code 4860 at the register. This chain has a cool mix and match special that allows customers to choose any two menu items for $5.99 each. Those items include everything from a medium, two-topping pizza to an eight-piece chicken wing meal, and plenty of other savory and sweet options. You can also earn points toward a free pizza by using the chain's Piece of the Pie Rewards program, which allows you to rack up points even if you order from a competitor. Hungry Howie's has salads, subs, wings and more. But on Saturday, the chain is offering a special on pizzas. Use the code "Medium1" to receive a medium, one topping pizza for just $1 when you order online. The chain also offers a variety of deals, from family meals that start at just $22 to $5 subs with all the fixings. As America's third largest pizza chain, there's probably a Little Caesars somewhere nearbu. On Saturday, score a $6 pretzel-crust pizza with creamy mozzarella, munster cheese and pepperoni between 4 p.m. and 8 p.m.
Papa John's has yet to announce a specific Saturday special, but they did tweet about bringing back the chain's large, $12 Philly Cheesesteak Pizza for a limited time. So that's definitely a meaty little something to look forward to. 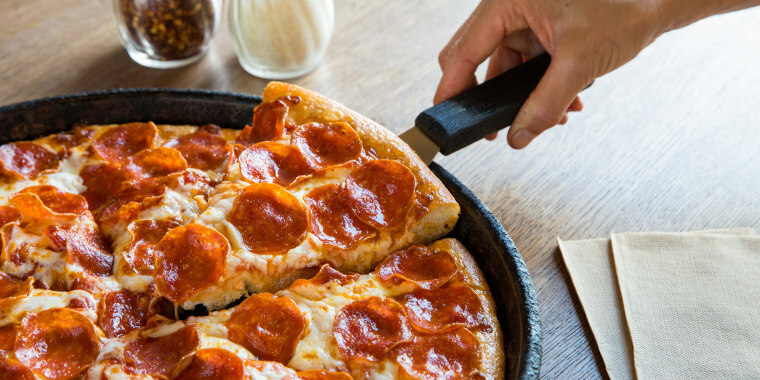 Fresh off its stint as the official pizza sponsor of the NFL, Pizza Hut is already back in the game. Get a large two-topping pizza for just $8, or mix and match other menu items like dessert and a medium pizza for just $5 each. This Latin-inspired pizza franchise based out of San Antonio, Texas, with more than 90 locations across the U.S., is celebrating National Pizza Day with this special offer: Order one 18-inch Patron XL Pizza with three toppings and receive a large one-topping pizza free. Jump the line in stores by ordering online here. This chain will donate $1 to the Leukemia and Lymphoma Society for every pizza purchased on Feb. 9. Folks who come in on National Pizza Day will also receive a coupon for one free personal pie (with cheese and the choice of any one topping) redeemable for a future visit.